Being in dusk and undercut with the audience won’t be the right advice in today digital era. The Massive digital transformation has given the opportunity to academic institutions to convey the best about the institute, showcase their values, culture, learnings, and opportunities to grow. To promote institute’s unique academic culture. To promote student’s diversity and best of being a part of SPJIMR. Highlighting the key concepts taught in various subjects. Promoting the various clubs, events, and activities at SPJIMR. Collect testimonials from Faculty and post in social media. The Objective of the campaign was to establish a unique identity of the institute, a place where students learn to have a dream, build the courage to live for the dream, build own path to achieve that dream. 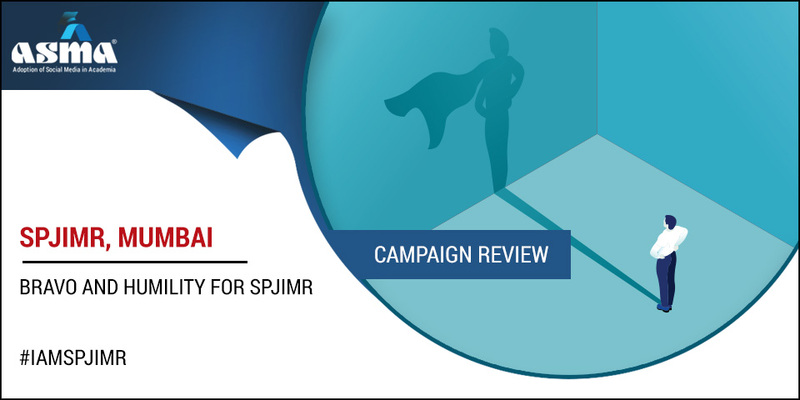 The strategic approach was crystal clear with very vibrant execution of compelling videos over social media handlings, not only this the adventures and self-motivated posts were shared over social media to appraise what is the best is a part of SPJIMR. Posts on twitter handlings are somehow a unique stating the innovative learning mechanism of SPJIMR makes it different among other B schools. Faculty testimonial short videos for academic learnings. Cross-linking the post to Institute’s website. Facebook post is full of content, rolling out the storyline about learnings at SPJIMR and why we call it #IamSPJIMR. Student testimonial relevant to opted course and journey so far in terms of learnings and working on live projects. The roller coaster journey to explore the world as much as one can. Learning beyond classroom session, non-academic learnings for personality development, development of corporate citizenship (DOCC), Abhudaya which is a science of spirituality and all. Faculty testimonial talking about the different aspect of learning brings more compelling views over the video.